This sounds delicious (and perfect for a PNW spring while we await the vegetables and/or vegetables dishes to match the weather). I think the problem for most people, me included, with making 30 minute meals in 30 minutes is a combination of bad knife skills and needing to check the recipe. I have decent, but slow knife skills. And I’ve noticed meal cooking runs much smoother when I don’t have to refer to the recipe at all. Lucky for me I find cooking to be fun and relaxing (when I don’t have a deadline breathing down my neck) so I don’t mind the process. Rachael has had a few good recipes (notably some eggplant subs with tomato jam I made a few years ago…todiefor) but largely I agree…she’s annoying and most of her recipes are kind of subpar. 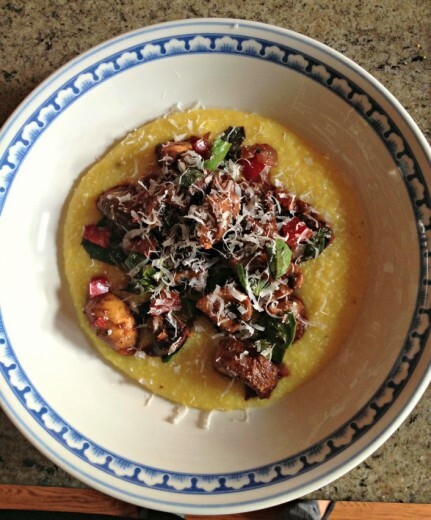 Polenta is a GREAT base for a 30 minute meal and it’s one of my favorites. I tend to make something very similar to this using whatever veggies I have on hand! I make caponata on polenta in the summer, (like Sicilian ratatouille! 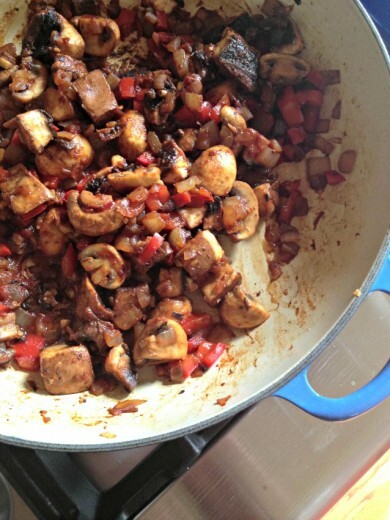 )….it’s one of my favorite veg meals, takes more like 45 minutes, but who’s counting. I used to watch Rachel Ray all of the time, but after awhile, I wasn’t learning anything new and moved on. Meanwhile, your polenta recipe looks gorgeous and delicious. I’ll have to leave out the tomato paste due to allergies. I’ll just make a bell pepper puree instead. Thanks for sharing. I love polenta! This was really, really good. Satisfying and spicy, and excellent flavor. Thanks! !